Amazon is rapidly expanding. Not just in terms of product variety, the number of sellers and number of buyers. Amazon’s reach and the countries you can sell your products in is constantly growing. Never before was going international so easy: with their ever-expanding logistics network and international customer base, Amazon reduces the barriers to global expansion for local sellers. In fact, one-quarter of merchants’ sales on Amazon in 2017 were cross-border, as Reuters reported earlier this year. This marks a 50% increase from the previous year. Selling globally is a massive opportunity for sellers to reach new markets and customers. But unfortunately, it is not THAT easy. In fact, import processes, tax laws, product regulations, and foreign legal environments are – quite literally – a pain to navigate. To make your global expansion easier, we have collected an overview of all the information you need to sell your products internationally. At this point, we’d like to thank Till Andernach from The Tide is Turning for his great feedback and support. Till has been crucial in validating research findings and providing industry-specific insights. The Tide is Turning helps Amazon sellers to expand internationally and move into the American or European market. For specific information about the different marketplaces – North America, Europe, Japan – download our country selling guides that include details on import processes, tax systems and product regulations for these countries. YES! I want to receive more useful resources to grow my Amazon business internationally. With the Sellics software, you can manage and grow your global Amazon business further. 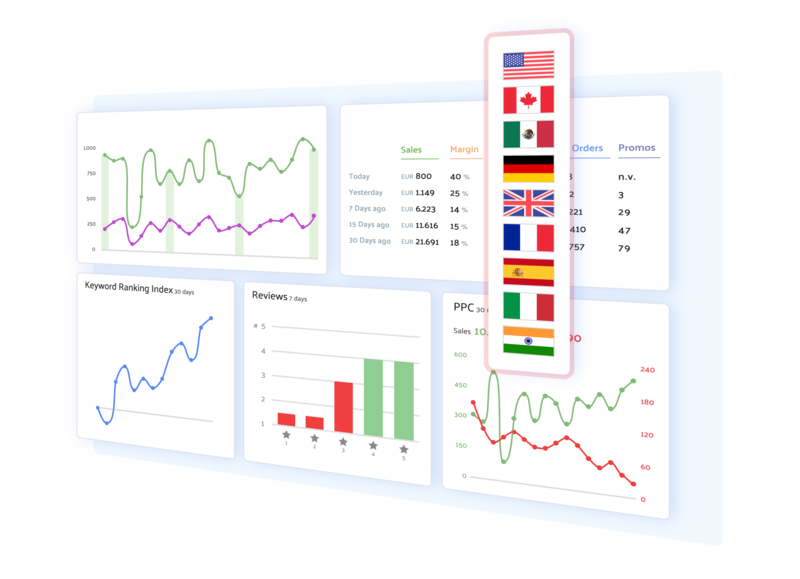 Our interface lets you choose between the different markets you are/want to be selling on (North America, Europe, India) and manage your profit, SEO, PPC campaigns, inventory, and product research all in one place. Disclaimer: Please keep in mind that we are not giving you financial or tax advice. Before starting to sell in a new marketplace you should always consult with a professional import and tax expert to give you individual advice on your specific situation. As of 2018, there are 13 Amazon marketplaces. Some of them are relatively new – the Australian market, for example, was recently established as an independent marketplace after changes in local tax laws prohibited sellers to ship their products to Australia as overseas entities. Usually, you need an individual seller account for each country – with the exception of the Unified accounts for North America (including Canada, the US, and Mexico) and Europe (including the UK, Germany, France, Italy, and Spain). Once you sign up for one of these marketplaces, you automatically gain access to all other countries included in the Unified Account. Selling to an international audience can massively increase your customer base. Especially when you are already succeeding in your local marketplace, global expansion might be the logical next step. And Amazon can make the process easy by taking care of shipping and customer service through FBA. It also allows you to enter a market quickly without having to spend a lot of effort in building trust. The Amazon brand paves the way for global sales. But global expansion (even with the Amazon brand having your back) is not all roses. You first need to understand your international customer segments. What are their preferences, demographics, income levels? Once you know that there is a good chance of your product to sell well, you need to build a process for selling globally. Navigating local customs processes, duties and taxes are one hurdle. Calculating the additional costs and figuring out a pricing model that keeps you competitive with local sellers the next. And then you also need to keep local regulations regarding product specifications and quality assurance in mind. Which product am I starting with: new or existing? Am I focusing on one product, or am I selling a portfolio of products? Is my product suitable for shipping internationally? Will my product sell well in that specific country? What are the national holidays and seasons? What are the cultural/political/social settings in that country and is my product a fit? Does my product comply with all the regulations in that country? Is my product compatible (i.e. measuring units, plugs, sizing etc.)? Once you find the answers to these questions and establish that there will be demand for your products, you can get started with your expansion strategy. Till (we already told you about him — he’s the guy who’s been helping countless sellers to expand overseas) has put together a comparison of different Amazon marketplaces (Japan, US, Australia, EU) which is also very useful to look at when deciding where you’d like to expand to next. 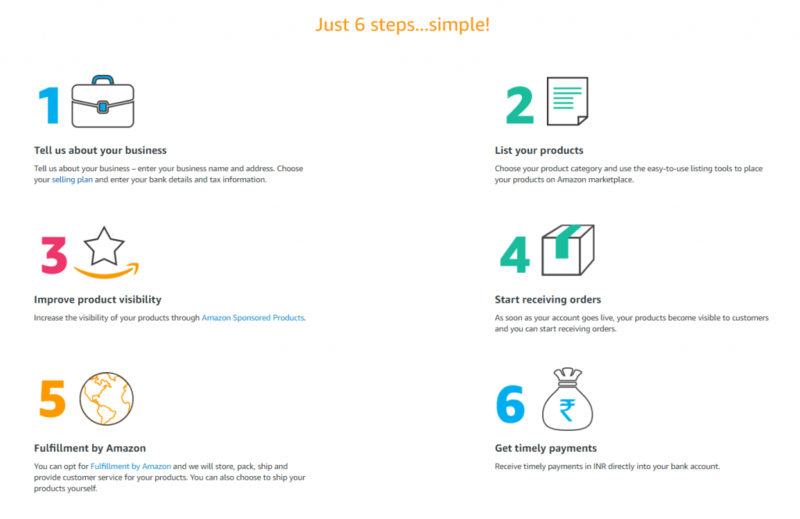 According to Amazon’s Global Selling Guide, it only takes 6 simple steps to start selling cross-border. The reality is quite a lot more complex. So let’s take a closer look and break down each of these steps. There are two special cases: the North American Unified Account and the European Unified Account. For these regions, you only have to create one seller account in one of the participating countries and you automatically gain access to the other marketplaces included in the region, and at no additional cost. For example, if you have a seller account in Germany, you automatically have access to the UK, Italy, France, and Spain. Similarly, you only need to pay the monthly fees for a US seller account and automatically get access to Canada and Mexico. You do, however, always have to pay the per-item fee (referral fees) incurred by Amazon when you make a sale. These vary according to marketplace and category. What do you need to register in a new marketplace? In your Seller Central account, select ‘Inventory’ from the menu bar and click on ‘Sell Global’. There you can see tabs for all the regions you can link. Select your target marketplace and either register as a seller in an international marketplace there, or, if you have already created an account, you can link it to your Seller Central. You can now manage all your marketplaces from your Seller Central interface. If you want to switch between them, you can use the drop-down menu on the top right of the page. Product listings cannot be created in bulk across marketplaces. As a private label seller, you will have to register your product ASIN on each marketplace and add the above details in the local language. There is good and bad news when it comes to language requirements. The good news is that you can manage your seller central in your native language. You can simply select the language in the top menu. The bad news is that you have to provide all your product listings and customer service in the local language of the marketplace you’re selling in. It is easier to meet Amazon’s strict performance metrics for sellers by providing customer support services in the local language. Hire a third party translation service and get them to help you with product listings and customer service. Sign up for Amazon FBA and they will take care of your customer service needs. Product listings for a foreign market need to be provided in the local language and should be written by a local speaker with sales copy experience. Also, keep in mind that you need to pay attention to Amazon SEO optimization — in the local language. Optimizing your content to improve organic ranking increases the chance of getting your product in front of the eyes of customers – and thereby make more sales. No matter where you are selling – Amazon SEO is crucial for success. Sellics is the leading Amazon SEO tool and provides you with the necessary data, insights, and suggestions to optimize your product listings (national and international) for more visibility. Once you have researched and included all necessary keywords and optimized your images you are ready to create your product listings. If you only have a small list of products that you’d like to sell internationally, you can manually create product listings through your Seller Central. Simply select the appropriate target marketplace in the drop-down menu on top of your page and proceed as per usual by adding a product through uploading an inventory file. If you want to sell a large variety of products internationally, you can use the EOI tool for quicker upload. However, for EOI to work, the detail page for the product (i.e. the product listing) needs to exist in the target marketplace already. By using EOI you are in charge of your listing and pricing for your products on each marketplace. It requires you to download your active listing report, edit it within Excel (add/remove SKUs), make pricing decisions and re-upload the Inventory Loader file. If you want to save yourself the work and synchronize your offers across marketplaces to automatically update prices in the target markets, you can opt for Building International Listings (BIL). Amazon offers the Building International Listings (BIL) feature to help international sellers manage their offers across marketplaces. By linking the home SKU with the target SKU, the BIL feature automatically updates prices in the target marketplace based on your individual settings. For BIL to work the product ASIN and thereby the product detail page needs to exist in both marketplaces. This tool helps you to duplicate and translate a listing you have set up in your home marketplace into a target marketplace in the EU. Until now, Amazon has always required you to manually create your product listings in the target marketplace. The Translate Your Products tool is trying to close this gap. It automatically adds the complete, translated product description to an already existing ASIN in a new marketplace so that you only have to create an offer to get started with selling on the new marketplace. 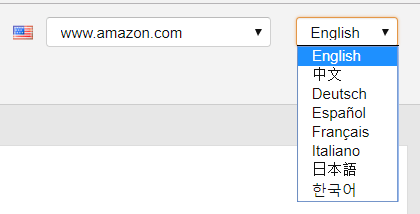 It takes up to two weeks for Amazon to upload a product listing created with this service. If you use BIL to connect offers across marketplaces, the translation produced by the Translate Your Product tool will be automatically synced with the source ASIN and pricing rules established in your BIL settings. Keep in mind that your product should have at least three reviews before you send traffic to the listing with a PPC campaign. Customers often do not trust products that have no or very few reviews. Running PPC campaigns on international marketplaces is exactly the same as running them in your home market. 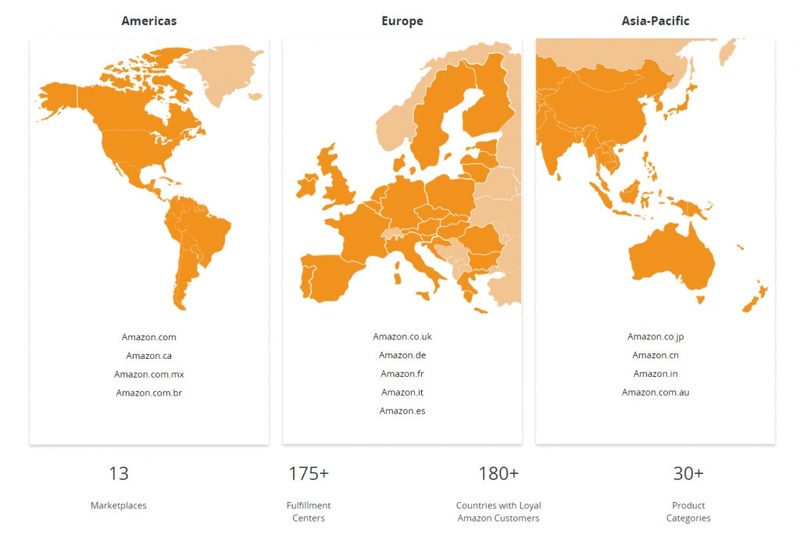 Amazon also provides you with an overview of average CPC values for each marketplace, which gives you a pretty good idea of how competitive each region is. Starting from there you can decide on your PPC strategy and how you want to spend your marketing budget. With Sellics you can manage your international PPC campaigns across marketplaces and rely on automated bid adjustments to optimize campaigns, meet your target ACoS and boost sales. Amazon offers different marketplace-specific promotional tools that you can take advantage off to get the first sales in. These include Free Delivery, Money Off Promotions, 1-click Purchase or Amazon Points that can be redeemed when buying other products from the same marketplace. Inventory management uses SKU numbers to differentiate your products and calculate how much stock is available – just as you know it from your home marketplace. How your SKUs are structured and organized depends on your shipping method and region you are selling in. Global SKUs can be used for the Unified Accounts within Europe and North America. It signifies a shared inventory pool between these marketplaces. Global SKUs cannot be used with the Amazon FBA shipping method. When you select Global SKU management, your inventory shows the stock available across all marketplaces (within the unified account). For example: in your seller central inventory management tab it would show that you have 300 units available in your North America Unified Account – 300 units in the US, 300 units in Canada, 300 units in Mexico. This might be confusing, as it does NOT mean that you have 300 units available in each country, adding up to 900 units overall. What it does mean is that you have 300 units available for that region. So when you sell an item in Mexico, the total amount will decrease to 299 for the entire country, i.e. each country. You should opt for Global SKUs when fulfilling your own orders for the European or North American market (and you don’t run warehouses in the respective target markets). If you are fulfilling your own orders, you can opt for marketplace-specific SKUs. This might be a good option if you are running your own warehouses in the target country and need to have a detailed overview of how much stock is available in each place. Keep in mind that your tax status can change if you are storing inventory in a target country. For more detailed information download our country-specific selling guides. You can ship your orders internationally either yourself (FBM) or through Amazon’s FBA network. Should you choose FBM or FBA? Usually, every country has determined an exemption limit (value threshold) that determines the customs process and amount of import taxes you have to pay. If products are valued below this threshold, they can often cross borders without having to go through lengthy customs processes. Especially in the beginning, when you want to test the market and you are selling a product that is valued below this threshold, it makes sense to choose FBM to ship your products. In comparison, shipping products via FBA reduces transaction costs but requires more time. Large shipments have to go through the customs process and comply with all necessary regulations. As a result, FBA might be the best solution when you want to scale your international business (and, of course, if your product value is above the exemption limit). Your Amazon price needs to include all costs – these change according to package dimension and weight, delivery time, origin and destination, local import duties, local sales tax. A customer selects your offer to be shipped internationally. Your pricing should reflect all additional charges. You act as the exporter of record and send your package overseas. The carrier you use (e.g. UPS, DHL or FedEx) usually acts as the importer of record by default. Make sure to pick an option where you prepay all duty charges. Your customer receives their order. You need to provide customer service in the local language and handle returns. If you do not know the local language you can hire a third-party service provider. If all that seems like a lot of work and effort, you can opt for FBA. You prepare your items according to Amazon’s packing rules. You ship your products to the Amazon fulfillment center in the target market. You are in charge of handling import processes and customs duties. Amazon will neither act as your importer of record nor pay any taxes or duties. Amazon stores, picks, packs and sends your items to customers in the target market. Amazon provides customer service and handles returns. There are different FBA options for each region. They vary according to where your inventory is being stored and how Amazon is fulfilling your orders. Country/region-specific FBA options are fully explained in our global selling guides available for download. To ship products to Amazon FBA warehouses in the new market location you can use courier services (e.g. FedEx, UPS, DHL) for smaller shipments, and experienced freight forwarders for larger shipments. Always make sure to ask the service provider about the customs procedures, and how to ensure that all import taxes and duties are covered so that your products do not get stuck in customs. Each country has established their own set of rules for importing goods and managing customs and duties (you may have guessed it: you can find further information in our selling guides). No matter where you are sending your products, you always need to ensure that they comply with local laws and regulations. As it is important to provide all the required information in a correct format, we highly suggest hiring a customs broker or agency to help you with these processes. Amazon’s fees are included in the exchange rate (approximately 4% — determined on a daily basis) that you need to pay for each conversion. As is the case with customs and duties, there are different regulations regarding sales taxes in every country. Most countries start charging sales taxes when sellers exceed a certain threshold in earnings. It is also common that sales taxes apply as soon as an importer stores inventory within the country – including storing products in Amazon fulfillment centers. New regulations regarding having a nexus within US territory and thereby qualifying for national sales tax. Each of these cases is explained in detail in the downloadable country guides. In any case – no matter where you want to expand your business to – we strongly suggest that you seek the advice of local tax experts for that country. It is a small expense compared to what the EU would charge in back-payments if they find that you do not comply with VAT regulations, for example. Manage, optimize and grow your Amazon business across international marketplaces from the same interface. One tool, 7 features — from profit calculation and SEO optimization to running effective PPC campaigns.